I’ve lived in Edinburgh for nearly 30 years and, especially recently, spent a lot of time around the south east side of the city, so I thought I knew most of what was there. 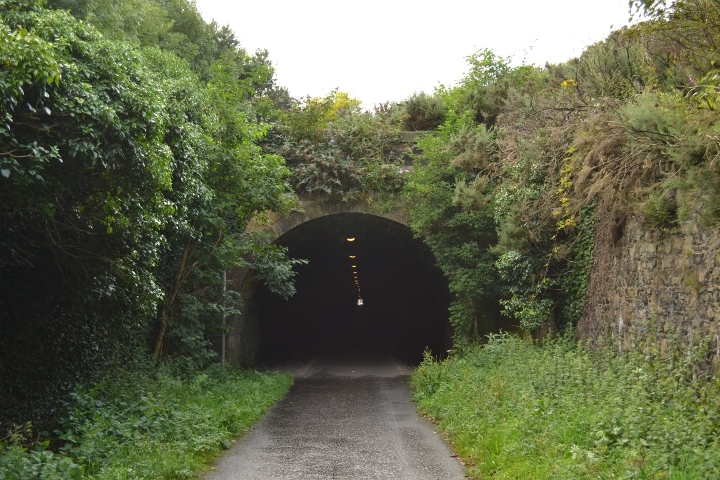 I didn’t, for example, think there was a huge great disused railway tunnel that you could walk through right on the edge of Holyrood Park. But whaddaya know. There is! It was built for Edinburgh’s earliest railway line, the Edinburgh and Dalkeith Railway, also known by the slightly curious name “Innocent Railway”. (Apparently this was due to the fact that it was horse-drawn at first rather than using steam engines, but I read an alternative theory that it could be because no-one was killed in the construction of the tunnel, sadly rare in those days). 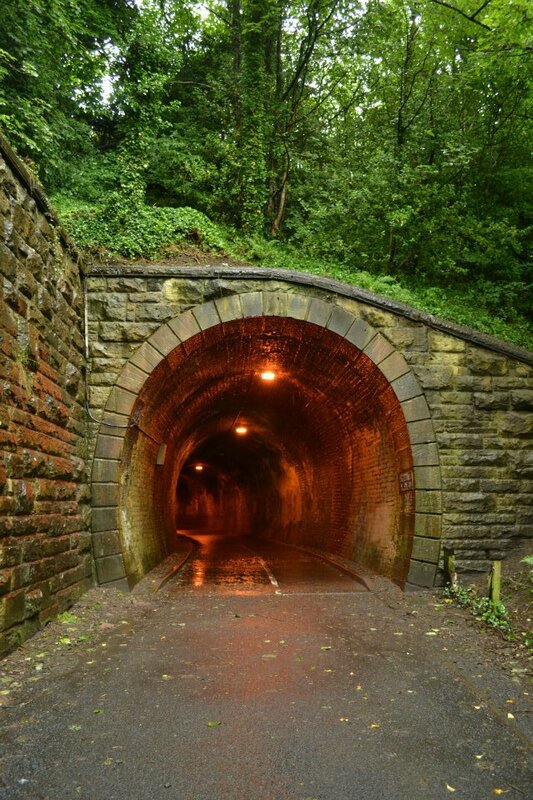 I like tunnels for some reason. I expect Freud would have had something to say about that, but in my case I think it’s mostly a geeky fascination with old industrial sites, combined with a slightly childish desire to go and explore hidden places. 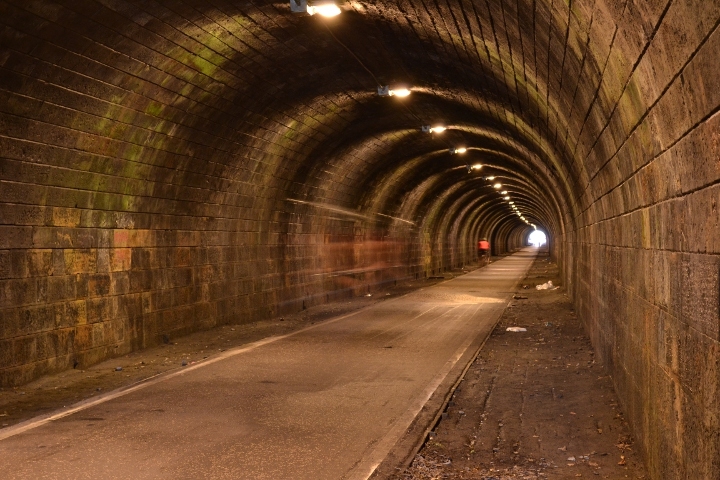 Edinburgh doesn’t have too many old tunnels. (Glasgow, being a more industrial city, has loads, but that’s a topic for a whole other post!). 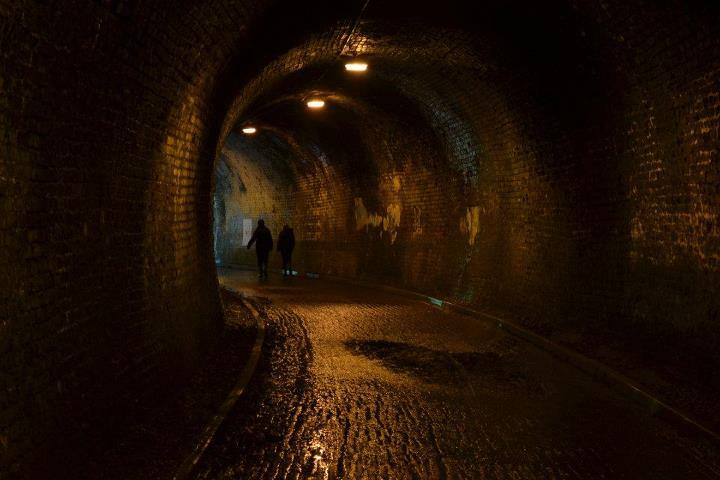 Most interesting is probably Scotland Street Tunnel on the old Edinburgh, Leith and Newhaven Railway. It ran 1,000 yards from Scotland Street Goods Station (on the site of which you can still see the blocked up north portal) down to Waverley. 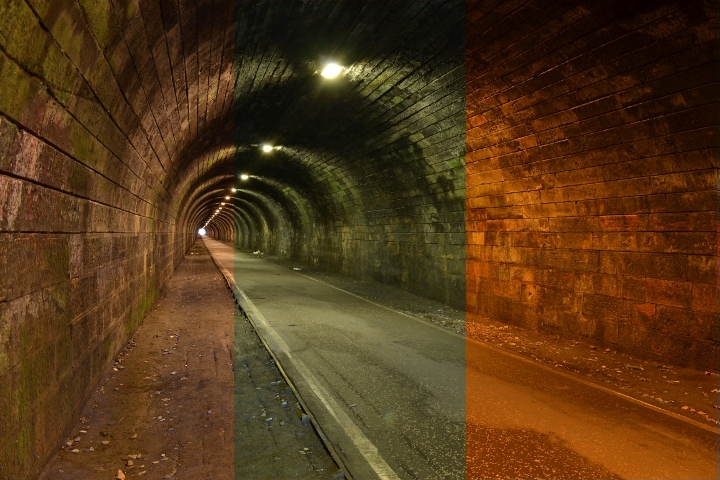 The south portal is now lost underneath Princes Mall but apparently a corrugated iron tunnel was put in when the mall was built to maintain access and ventilation; it exits near Platform 19 of Waverly Station. The main tunnel was closed to trains in 1868 but it’s still down there and was used as an air raid shelter during World War II. on the Water of Leith Walkway at Colinton Dell. It’s pretty short but it’s on a curve so you can’t see both ends at once, which makes it seem longer. 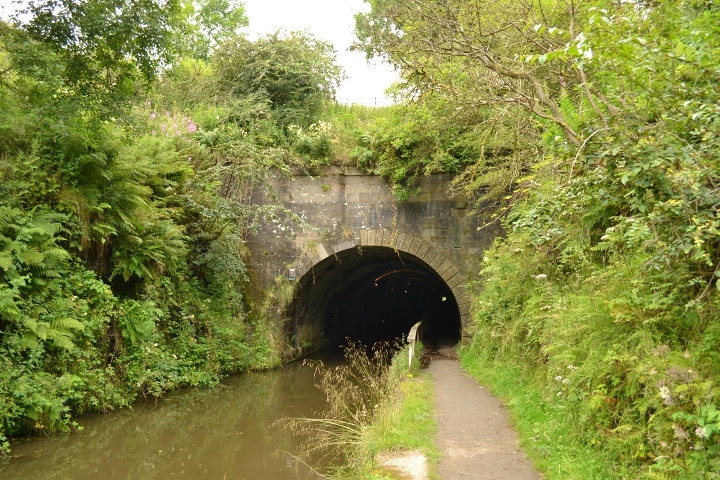 Apparently there was no pressing technical need for a tunnel here, but the local landowner didn’t like the idea of the canal spoiling his view and forced the canal company to put it underground instead. And good for him, I say. It certainly made my walk through to Falkirk High Station a lot more interesting. 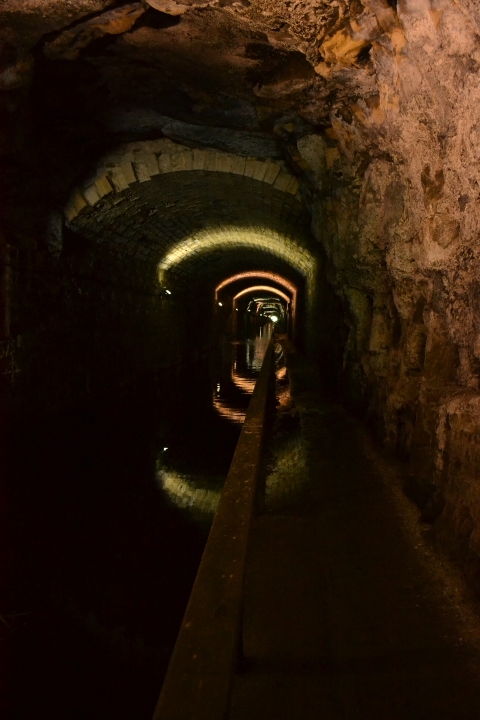 The roof seems a lot more porous than in any of the railway tunnels, probably because the middle bit is mostly just bare, unlined rock – there is a constant dripping of water into the canal as you walk through, and stalactites in places. This was the first time I’d been here since the Union Canal re-opened in 2002, and I was glad to see that the addition of electric lighting hadn’t detracted from the atmosphere of the tunnel too much. In the course of trying to organise my life enough that I don’t feel I’m being crushed under the weight of a disorganised mass of files, papers and projects, I discovered a very neat little software tool called Fossil. (This probably isn’t of interest unless you develop your own software or at least do some sort of creative projects using a computer, so feel free to skip it if you don’t. The rest of you, read on!). For a while I’d half-heartedly wondered about setting up some kind of source code management system and maybe also a bug tracking system for my own projects. It’s not so critical to have all this stuff on a single person project as it is on a bigger collaborative work, but at times things can still get disorganised enough to be a pain, especially if you have a bit of a break and then try to come back to it later. Where did I put the most up-to-date copy of that emulator’s code again? Is it on my desktop machine with all the other projects? Or did I make some updates on my old laptop? Maybe the master copy is on an external drive somewhere, or in that folder called “new”? Oh, now I remember, last time I worked on it was on the Raspberry Pi, but the changes I made there probably won’t work on any other machine. Come to think of it, what do I want to do on it next anyway? I know there was a list of bugs and missing features… it was in my green notebook I think… or maybe it’s in a text file in my Dropbox folder… or did I have a fit of organisation one day and add them all to TaskCoach as individual tasks? Aaargh! I liked the idea of having a single repository of the code in one place so I always know where it is, and being able to get earlier versions back when I break it would be great as well. A ticket system for the bugs and missing features would also be useful. I considered installing a Trac server somewhere – I’d used it on work projects and liked the way it gave you source code management, a wiki and bug tracking/ticketing system all in one place – but I quickly gave up on that when I saw the length and complexity of the installation instructions. Using Trac for projects like mine would be like hiring a combine harvester, learning how to drive it and then using it to give your front lawn a quick trim. Enter Fossil! I can’t remember where I heard about it, I think it was a forum post somewhere, but I’m very glad I did. It does all of those things perfectly adequately for small projects (probably even for medium sized multi-person projects) and is much, much more lightweight and easy to install than the likes of Trac or GForge. In fact it doesn’t even need to be installed at all – it comes as a single executable (available for Windows, Mac, Linux and others) with no dependencies on other software at all. You just download it, and away you go. Each project repository you create with it is also stored in a single file so it’s easy to keep track of it, move it around, back it up, etc. You can access the source control functionality from the command line (commands like “fossil add”, “fossil commit”, clearly reminiscent of well-established SCMs like CVS and SVN), or you can fire up the web interface in your browser by typing “fossil ui”, and that gives you access to the other functions like the wiki and the ticketing system. I’ve been using it for a while now on one of my projects and definitely intend to use it for the others as well once I start working on them more seriously. I must say, so far I’m quite blown away by how capable it is; shoehorning a fully working source code manager, bug tracker and wiki into such a tiny, fast and easy to use package is an amazing achievement. I’m always apprehensive about trying out new development tools. It’s pretty common to be left high and dry with an incomprehensible error message because your version of some library you’ve never even heard of is version 1.2.29 instead of 1.2.28, but Fossil has none of those issues. It Just Works. (I haven’t tried to use some of the more advanced functionality such as the distributed SCM, so I can’t really comment on that. But for small projects using a local repository, it seems ideal). When you’ve lived somewhere all your life (or at least for the vast majority of the portion of your life that you can actually remember, as in my case), you tend to take the things that are there for granted… even if they’re the very same things other people will travel thousands of miles to come and gawk at. Case in point: when Edinburgh goes crazy with the largest arts festival in the world every August, I always used to spend more time getting irritated by all the tourists getting on buses and gazing around in wide-eyed astonishment, as if they needed not just the fares and destinations but the entire concepts of fiat currency and motorised transport explained to them while I just wanted to get home from work before midnight, than I did actually going to shows. But this year will be different, thanks mainly to living with a certified Fringe addict. We’ve been to two shows already, which is quite good going considering there have been exactly two nights of August so far. Last night’s was a complete live performance of Mike Oldfield’s Tubular Bells by two men. (For those of you that don’t know me, I am a massive Mike Oldfield fan. For those that do, my apologies, I’m afraid I’m going to bang on about Tubular Bells yet again). 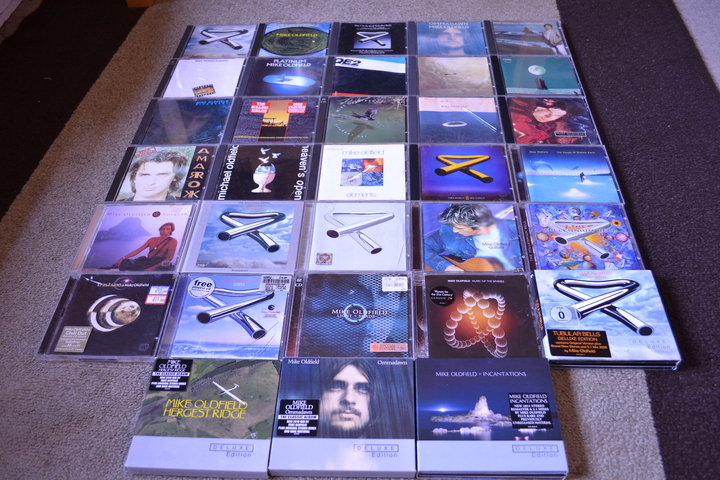 This is my collection of Mike Oldfield CDs. Please don’t be alarmed, I am seeking professional help. I didn’t know what to expect at all. It always feels a bit dangerous going to see a new interpretation of something that’s so close to my heart (in this case the album that first made me realise how amazing music could be), but this time I wasn’t disappointed! For a start, it was very faithful to the original version, more than I would have thought possible with only two musicians and no pre-recorded backings, and probably even more so than some of Mike Oldfield’s performances of it. They also had a pretty impressive range of different instruments; although there were synths and samplers, they didn’t rely on them too heavily. I counted six guitars, a mandolin, one and a half drum kits, a glockenspiel, two kazoos and of course the eponymous long thin metallic hanging things in addition to the four assorted keyboards and the bewildering tangle of wiring underneath. The two guys both switched from one instrument to the next at an incredible speed, sometimes playing two at once while also adjusting things with their feet. I also didn’t see any sheet music or notes anywhere on the stage, so the whole thing must have been quite a memory test. But despite all this, one of them still found the time to down a half-glass of red wine during one of the quieter moments.